These retractable traffic cone bars are very simple to use and easy to deploy requiring little to no storage space. The poles themselves are robust and can be extended from 120cm to 210cm easily creating a barrier to demark work areas. The hoops and telescopic rods are made from plastic with a striped finish for improved visibility. There are two colours available with both sets of poles, red and white or black and yellow. Lightweight - A single worker can easily carry enough poles for over 30 metres of barrier. Very Easy To Deploy - Cones do not need to be evenly spaced as they can be quickly adjusted to fit any space between 120cm and 210cm. These poles are most commonly used with either 75cm or 100cm traffic cones such as the Starlite, Dominator or Highwayman cone. The different colours allow you to create different boundaries where different safety gear is required. JSP is a major manufacturer of traffic products making some of the best traffic management equipment on the market. Why Buy From Start Traffic? 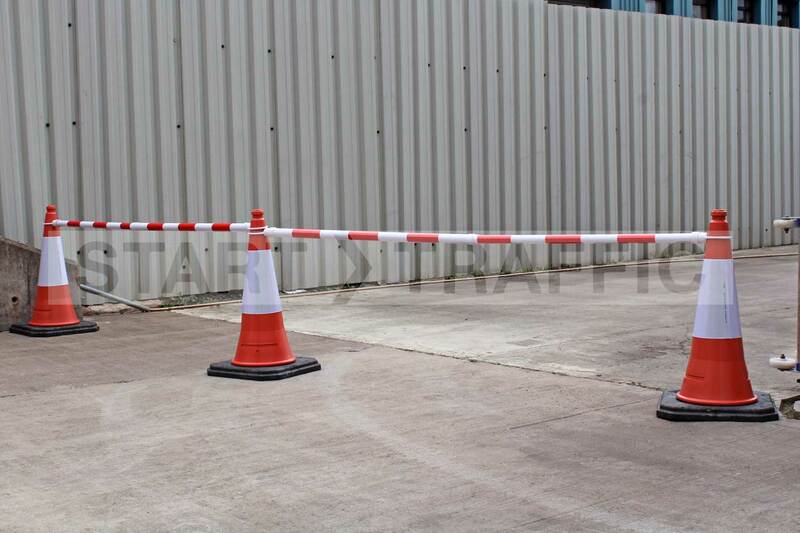 We stand by the products that we supply and will happily assist you in getting just the right product for the job, whether that is a traffic cone bar, traffic cone, barrier or wheel chock. You can call us today on 01905 794 875 and speak to our sales team who will be happy to help you get the right product first time. Length 1300mm overall, adjustable 1220 - 2120mm centres.